Acting Out Social Skills: Beyond the Basics prepares students for social interaction challenges commonly found at work. Students role play, analyze, and discuss seven work-related dilemmas as viewed from the perspective of three different characters. Students are guided through a structured process to resolve each dilemma. The dilemmas address seven universal character virtues: Responsibility, Respect, Fairness, Citizenship, Trustworthiness, Caring, and Civic Responsibility. The program consists of a full-color Student Book and Teacher’s Guide. The Student Book is organized theatrically with settings, actors, and scenes. Student activities focus on emotions, behaviors, and alternative methods to resolve social problems. The Teacher’s Guide includes a Student Book with all the worksheets completed. The teacher guides include a Win/Mac CD with a PDF and a Classroom License for printouts. By June Stride, EdD. Books are covered spiralbound, 150–160 pages, full color, 2011. 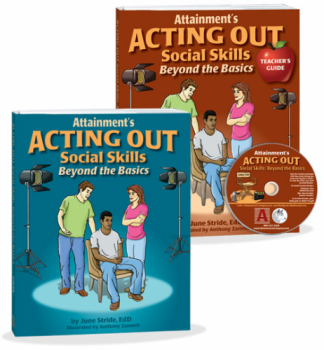 Acting Out Social Skills: Beyond the Basics Introductory Kit includes one Student Book and a Teacher's Guide with the PDF CD. 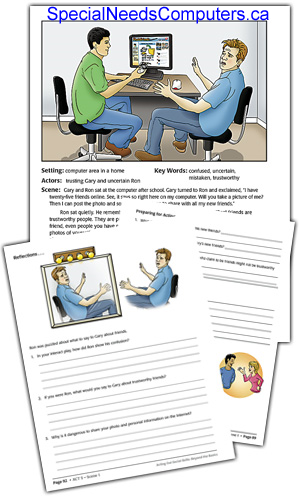 Acting Out Social Skills: Beyond the Basics Classroom Kit consists of 8 Student Books one Teacher’s Guide with the PDF CD.